From lost settlements on the wild shores of the Amedio Jungle to a dragon's lair in the Crystalmist Mountains, this new anthology of AD&D adventures has something for every adventurer. Search for the fabled jewel, the Eye of Nur Dav, or seek a powerful magical item like the Helm of Selnor. You must be on your guard, however, for each of these adventures is designed to test the mettle of the experienced adventurer. So, whether you wish to pay a visit to the archmage Bigby's humble abode, search the tombs in the Cairn Hills, or pass the time of day riddling with a sphinx, these forays into the World of Greyhawksetting will be a challenge for parties of venturesome players, who either excel at role-playing, combat and puzzle-solving, or who wish to. Who knows, you might even win the treasures of Greyhawk. WGR2: "Treasures of Greyhawk", by Walter Baas, Jack Barker, Louis Prosperi, Tom Prusa, and Roy Rowe, is the second book in the "WGR" series of World of Greyhawk References. It was published in June 1992. Continuing the "WGR" Series. By 1992, the Greyhawk Wars (1991) had come and gone, but TSR had not yet fully embraced the potential of the revamped setting. As a result, some of the year's new Greyhawk books — such as WGQ1: "Patriots of Ulek" (1992) were specifically set after the war — but "Treasures of Greyhawk" could instead have been set in any era. 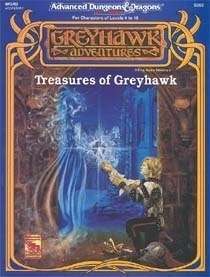 "Treasures of Greyhawk" was just the second "WGR" book, appearing almost two years after WGR1: "Greyhawk Ruins" (1990). Like its predecessor, it's not really a reference book. Instead it's an anthology of adventures of all sorts — following in the footsteps of similar short adventures found in Greyhawk Adventures (1988). Just a month after the publication of "Treasures", TSR began publishing "WGR" books that were more obviously References, the first of which was WGR3: "Rary the Traitor" (1992) — the book that really catapulted Greyhawk into a new era after the Greyhawk Wars. Expanding Greyhawk. "Treasures of Greyhawk" is lightly set in Greyhawk. Its adventures namecheck many locations and several deities, but it doesn't provide much detail on major locales. The various adventures are set throughout Oerth: in the jungle lands of Amedia, the City of Greyhawk, the Cairn Hills, the Crystalmist Mountains, and the Hold of the Sea Princes and on the southern shore of the Nyr Dyv. Various adventures are also linked to Heironeous, St. Cuthbert, and Zagyg. "Bigby's Modest Home" is the adventure most replete with Greyhawk lore. 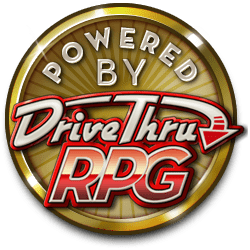 It follows up on the (temporary) death of Bigby in WGA4: "Vecna Lives!" (1990) and allows the players to raid oneof his domiciles. Expanding Wildspace. Spelljammer (1989) was sometimes criticized for not touching upon the core settings of Greyspace, Krynnspace, and Realmspace in its published adventures. "Treasures of Greyhawk" offers a rare exception: "The Neogi Nest" gives players a chance to mix together Spelljammer and Greyhawk. About the Creators. The main authors of "Treasures of Greyhawk" all did limited work for TSR in the early '90s. Several of them also contributed to MC12: Monstrous Compendium Dark Sun Appendix: Terrors of the Desert (1992).